Super friendly staff! I feel I am in the best possible hands, because the professionalism, knowledge, and helpfulness are wonderful. I am extremely happy with my level of care and very pleased with my selection of chiropractic because Dr. Bill is the best! The Family Wellness Center has and continues to make me feel “Well”. The atmosphere is calming, the staff is kind and considerate, and I have had an extremely positive overall experience there. I was asked if I wanted to make another appointment, but appreciated that I was given the opportunity to process everything we discussed without feeling like I had to make another appointment immediately. I think that you are a wonderful group of people that are committed to helping others. Everyone in the office is so friendly and kind. I always feel a great sense of calm and caring as soon as I walk in the door. I’m so happy that I started coming in for treatment! Enjoy every minute there. Everyone is so helpful and informative to encourage you to feel well and strive to help you on your wellness journey. I’m on my way, haven’t bent over and tied my shoes without pain in months. I know that doesn’t sound like a big deal but it sure is to me! Thanks, can’t wait to see how I’ll progress in the weeks to come. I feel very positive about my treatment plan and all the people involved. The entire staff was friendly and eager to help! A very great experience and would recommend this center to others and already have! I felt the whole staff to be genuinely warm and friendly. The atmosphere is both efficient and gentle. There is an overall sense of peace and calm that is infectious! I look forward to every visit as a treat not a chore. Before experiencing chiropractic adjustments from Dr. Bill, I had an iron deficiency. This deficiency brought on such symptoms as slurred speech, problems controlling my hands, problems walking and dizziness. I had consulted my family physician that recommended me to a neurosurgeon. After having an MRI, these doctors had no recommendations to improve my problems. Since I’ve been coming here I’ve had great ease in movement, and all problems and symptoms have been alleviated. Weekly adjustments give physical comfort and facilitate the emotional healing process. The things I like best would be the comfortable environment, the peacefulness which allows me to continue my healing and the customized care which was directed towards my questions and needs. My family suffered from a variety of health problems, which lead us to this office. My son Robby had migraine headaches 3-4 times a week, my husband had high blood pressure, my son Michael had chronic ear problems (cholestatoma). My son Tommy had allergies and asthma, I had lower backaches all the time, and I wanted my 9-month-old little baby to be as healthy as possible. Now my son Robby hardly has any headaches, my husband’s blood pressure has reduced to the point where he is no longer on drugs. My son Michael has had no ear problems at all since we started getting chiropractic adjustments and his ear specialist is amazed. My son Tommy still has allergies but his system is now strong enough to deal with it, he no longer uses pills, inhalers, or nose sprays. I have zero pain in my back, and my daughter is nearly 2 years old and only has taken a drug one time in her life, which is truly a miracle in my family. What I like best about regular chiropractic care is that it makes sense. The principal that if your whole spine is in alignment then the spinal chord can get clear messages from the brain to the whole body for it to function at top performance. This made sense to me from the very first visit to Dr. Bills Health talk. One thing I love about visits to Dr. Bill’s office is that I know he’s concerned about our health and finds joy in our progression to total health as much as we do. We thank God for the inspired practice of chiropractic. Although I was suffering from a variety of “medical maladies”, I mainly came in because of chronic low back pain resulting from an injury from about 15 years ago. I had always been very skeptical about chiropractic care, a non-believer you might say. I’d reach a point of discomfort where I was willing to try anything. Pain can be an effective motivator and Dr. Bill’s explanation of his philosophy seemed logical enough to get me started. A good friend of mine I try Dr. Bill and I hoped for relief from my low back pain. Within a few short weeks my low back pain was gone, and my sinuses cleared (I’ve always suffered from allergies), and have remained constantly clear, which for me is a true miracle! For the last 3 yrs I’ve struggled with other symptoms, which have vanished as well. The MD’s didn’t know what to do with me. I was getting terrible recurring dizzy spells that have since vanished and I’ve been medication free for months. My wife and 4 year old son are on board with Dr. Bill now as well and what I like best about it here is the feeling of being with family and getting healthier together. Before receiving chiropractic care I had high Blood Pressure along with pain in my lower back. Ever since I’ve started coming in for chiropractic care from Dr. Bill, my blood pressure is lower and also my pain in my lower back is gone. I like the fact that if I have trouble I can have an adjustment ASAP. Also I like the fact that it is close by. My chiropractic care has helped lower my blood pressure with the easy adjustments I have undergone. My spine is fused and most mornings I struggled to get out of bed. Once my feet were on the floor I still couldn’t straighten up. A friend gave me a gift certificate for Christmas and since starting care in January, it’s been possible to get up when the alarm goes off without having to think about it. My whole family has begun care since. Since my family and I started we’ve all had our little miracles for the problems each of us had. We have thankfully found a new Chiropractic way of life with LeVan Family Chiropractic – about the greatest thing since sliced bread. I suffered from tension headaches just about every day at work, low back, hip, and knee pain from standing on hard floors which could only be relieved by sitting or lying down for an hour or so. Since coming to see Dr. Bill I can now feel when my spine is locked up. I feel that I am better able to handle the stresses of my work. I seem to be better in touch with my emotions and am more apt to show anger or sadness than I was before. Typically, previous to care here, I internalized everything and then I would just get filled up and shut down from the rest of the world. Since receiving care from Dr. Bill, I haven’t had any of these shutdowns, which I believe were episodes of mild depression. My biological cycles have returned to normal and the feeling has returned to the outside of my right thigh, which had been numb for more years than I can remember. None of the other chiropractors I had been to had done any good. I like the fact that ever since receiving chiropractic care, I’ve not had to see an MD for any colds, infections, or other treatments. Which is good because I hate going to the doctor’s. I feel much healthier and I love coming here because Dr. Bill and Deborah give the best hugs! They really care about how you are; it’s not just a rhetorical question when they ask. I have had lower back pain for about 8 years. I lived with the pain on a daily basis, the level of intensity would vary from pinched nerves in my legs, which left me unable to walk or stand upright to just discomfort in my lower back. Since I started my care the pain I lived with on a daily basis is gone. I had forgotten what it felt like to move freely without pain. There are day’s that I do have pain still but nothing like I had for the last 8 years. Everything seems a little brighter now. Thank you for giving me my life back. I don’t feel like it’s a chiropractor’s office when I walk in, more like a friend or relative. It’s a very relaxing place you feel completely at ease. I enjoy the closeness and the friendship. My asthma got to the point of needing medicine to breathe. I had neck pain constantly along with lower back pain and sinus infections. I now have no asthmatic conditions and take no medication. I haven’t had sinus infections since starting care with Dr. Bill. I feel much leaner and a lot of release. My attitude is more positive and my inner ear for listening to my body has strengthened. I know today that my body’s wisdom knows exactly what I need and heals my ills. Dr. Bill’s techniques are gentle and freeing and there is an atmosphere of peace and harmony here. They also have flexible hours. I had neck pain, stiffness, shoulder pain, symptoms of carpal tunnel syndrome, pain in the knees, tendonitis, lack of energy, tightness in the chest at night when I was sleeping, pain in my hips, and arms along with other issues. I have gone to other chiropractors but didn’t commit to them because their methods were different. I now have more energy, the tendonitis, carpal tunnel, tightness in chest and other symptoms have either disappeared or improved, and I have only been coming here for a little over a month. I really like the open informative manner here, and the caring friendly attitudes. I had no health complaints coming into this office. Since I was a child, I had severe allergies every spring and summer. I assumed that I would always have them and it hadn’t occurred to me that chiropractic care could help. I came to the office for greater health. The most noticeable difference is that after 20 years of chronic allergies, through chiropractic care I have them no more!! I didn’t even suspect that my allergies would disappear. Regular chiropractic visits were a great help when I quit smoking almost 2 years ago. I experience a greater sense of well being and health both physically and emotionally due to my chiropractic care. What I like best about chiropractic is its purity and simplicity, which produce vast and dynamic expressions of life. A clearer nervous system benefits me in all areas of my life. Anything I attempt or do is done more effectively and efficiently when I get my spine checked regularly. I suffered from effects of Lyme disease, which manifested itself in the form of arthritis, fibromyalgia, meningitis, and nerve damage in my neck and spine. I had a stiff lower back and constant headaches and every couple week’s severe headaches. Since my friends referred me here, I feel better than I have in years. My neck is not stiff and has stopped hurting. The headaches have stopped and I can sleep all night for the 1st time in years. I also feel more at peace and can breathe deeper. I love the Peace! I had digestion problems. I got so much gas after eating; I would get attacks and I thought I would die. My doctor gave me pills to scatter the gas and it didn’t really help. I took everything I could think of, but nothing worked. I was on blood pressure medicine, and took vitamins by the handful for the past 30 years. No matter what I would take or do, nothing worked. I really felt hopeless and depressed; I can honestly say I was in bad shape. I felt my life was over. I feel grateful to be able to say this; I feel I have a new lease on life. I now enjoy eating, my work, and going for walks in the outdoors. I now can fully appreciate the little things in life I never paid much attention to. I no longer take my blood pressure medicine. No longer taking pain pills, I sleep much better, my nerves are so much better. 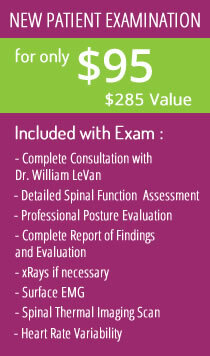 I have been to several chiropractors in my time, but did not receive too many results. I can honestly and truly say this to you Dr. Bill LeVan, you are the only Dr. that ever really helped me. My heartfelt thanks go out to you. All the medical Dr’s. did not do a thing for me. They gave me a drug, which never helped. Another thing I was bothered with a great deal was my sinuses. Way back when I was in my teens I would get so sick in my stomach, my eyes, head, and the back of my neck hurt so bad I would have to take pain pills to get relief up to the time I went to see Dr. Bill – I was still getting sinus headaches. Now I can truly say I haven’t taken one pain pill in the past year. I may get the symptoms, but it doesn’t last long. Also I hurt so much between my shoulder blades, my doctor said it was arthritis and I would have to live with it. It felt like a 20-pound weight on my shoulders. Now, thanks to Dr. Bill’s adjustments, I can work all day. I don’t feel that pressure, my back will get a little tired, but I’m not uncomfortable and it sure is a blessing. Before I went to see Dr. Bill, I prayed and prayed for the Lord to help me. Deep down I know he didn’t forsake me, my prayers were answered. There is no doubt in my heart and mind that through Dr. Bill and his adjustments, God has helped me. I feel justified in saying this, that Dr. Bill, you’re truly a blessing to mankind. May God really bless you, now and forever, however long I live, I’ll be so grateful to you. What brought me to your office was these constant headaches, neck pain, shoulder pain and my left eye was drooping quite severely. All my life, daily stress continued to accumulate in my neck. I had seen numerous other doctors and none of the treatments ever helped. Since starting chiropractic care with Dr. Bill, all of my symptoms have been alleviated and I noticed that my digestion is notably improved. Your office takes a pro-active approach that addresses root causes and not just the effects (symptoms). What I like best is that you are sympathetic to individual patient needs and you stress over-all health concerns. About four years ago I started having constant mid and lower back pain and arthritis in both big toes. I also experienced allergies, sinus problems and neck pain. Since chiropractic care, my whole life has improved for the better. I feel more “alive” and confident. Most of my initial complaints have improved greatly. I have better focus in whatever I do. I learned a lot about the human body. All my senses (hearing, etc.) have improved. I’ve discontinued taking vancanase spray for my sinus and my body is taking good care of itself. I have not had a “major” cold for a long time, while everyone around me did. I like knowing my body is functioning at its highest level. With every adjustment, I feel different things come alive. I like the individual care given by Dr. Bill. He never hesitates to share his knowledge and experience. I run on the school’s long distance track team – both the mile and 2 mile. I had been running for two years prior to coming to see Dr. Bill, and for those two years I was plagued with nagging hip pain. I ignored the pain and hoped it would go away, but it didn’t. Since last year I did no off-season or pre-season training, but I did begin to receive regular chiropractic adjustments from Dr. Bill about one month before track season started. As a result, I now run pain free. What is more amazing and exciting, is that even without any off-season training, after only two weeks into the season, I am already running faster and better then I was at the end of last season. This is unheard of. Even my coach said “I never thought you would run that fast.” I now look forward to a successful and “fast” season. Regular chiropractic adjustments have given me more energy and more strength then I have ever had in my life. Every aspiring athlete should explore chiropractic. I would have to take pain pills for my back and neck problems. I also had leg and foot problems on and off. Since starting chiropractic care at LeVan Family Chiropractic my back and neck are much better and my foot problem is completely cleared up. I no longer have to take any pain pills or blood pressure medication.